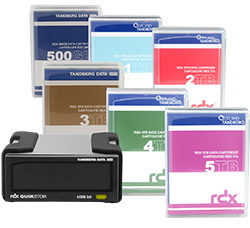 The Overland Tandberg Data RDX® technology is a disk-based removable media storage system which offers leading random access performance and high transfer rate like disk along with the archive life, removable/ portability and cost benefits of Tape. The RDX system consists of a drive and removable disk media with capacities fully forward and backward compatible. RDX is the best of disk and tape combined. The Overland Tandberg Data RDX media offers a rugged design for maximum data protection and secure handling. The media is well suited for data protection and archiving. It has an electrostatic proof design and is drop protected. New media types have to pass several tests before they are introduced to the market. This ensures high quality, reliability and durability. The media is keyed, so it is not possible to insert it into the drive in a wrong direction. A write protection switch prevents from deleting or overwriting data. The RDX Media is offered in different versions to satisfy various business needs. The HDD-based media is suitable for most backup, archiving and storage tasks. It is available with capacities from 500GB up to 3TB and an affordable solution for SOHOs and smaller SMBs. The SSD-based version fulfils high performance requests and is ideal for data storage and data exchange of large files and for fast backups of big datasets. Its high transfer rate of 260MB/s ensures fast write and read operations. SSD media is ideal for very rough environments and withstands high temperature, humidity and vibration. SSD Media is available from 128GB to 256GB. RDX WORM media meets an expanded set of regulatory compliance requirements and is ideal for use with a large number of archiving applications, like enterprise content management and document management systems, where data must not be deleted or overwritten. WORM is a software based solution and is available for HDD media up to 1TB. RDX Media have an archival life of more than 10 years and insertion/ejection cycles of more than 5000 times. This enables RDX not only as an ideal media for backup and long term archiving but also for daily storage usage. Drop Shock (non-operating) 1 error in 1014 bits read 1.5m drop to tile over concrete floor. 1m drop to tile over concrete floor. Download the Overland Tandberg Data RDX Media Datasheet(PDF). LTOStorageWorks.com is a division of Virtual Graffiti Inc, an authorized Tandberg Data reseller.